Remotely Operated Vehicles (ROVs), have been used to conduct undersea tasks, deemed unsafe for humans, for many years. But while they have been very useful at tackling projects like oil rig repairs, the vehicles lack the finesse anddexterity required to handle fragile missions like monitoring coral reefs. Their traditional boxy shape also makes it difficult for the robots to penetrate small areas without damaging the surrounding flora. Now thanks to Stanford University’s mermaid robot, OceanOne, these shortcomings may be a thing of the past. The idea of the humanoid robot was conceptualized three years ago, by researchers at the King Abdullah University of Science and Technology (KAUST) in Saudi Arabia. 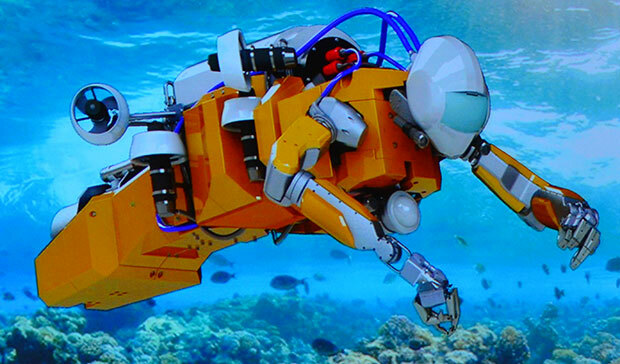 They believed that such a robot would be ideal to help monitorcoral reefs in the Red Sea. To bring their vision to life, Associate Professor Khaled Salama turned to colleagues atCalifornia’s Stanford University for help. Professor Oussama Khatib, the Director of Stanford’s Robotics Lab, and his team of undergraduate and graduate students were intrigued by the idea of building an underwater robot and instantly agreed. While it took a few years, the first prototype of OceanOne, which was released in April 2016, is everything Salama and his team had hoped for, and more. Measuring about 5-feet from head to “tail,” the robot’s stereoscopic “eyes” allow the pilot to view deep into the ocean without entering the water. Its “fins” provide ample storage space for batteries, computers, and the eight multi-directional thrusters that help keep the robot stable in turbulent waters. Also, unlike traditional ROV’s, OceanOne’s electronics are waterproofed with oil rather than being encased inside a rigid case. This simple design improvement prevents the electronics from buckling under the water pressure and enables the robot mermaid to reach depths of up to 2,000 meters without collapsing. 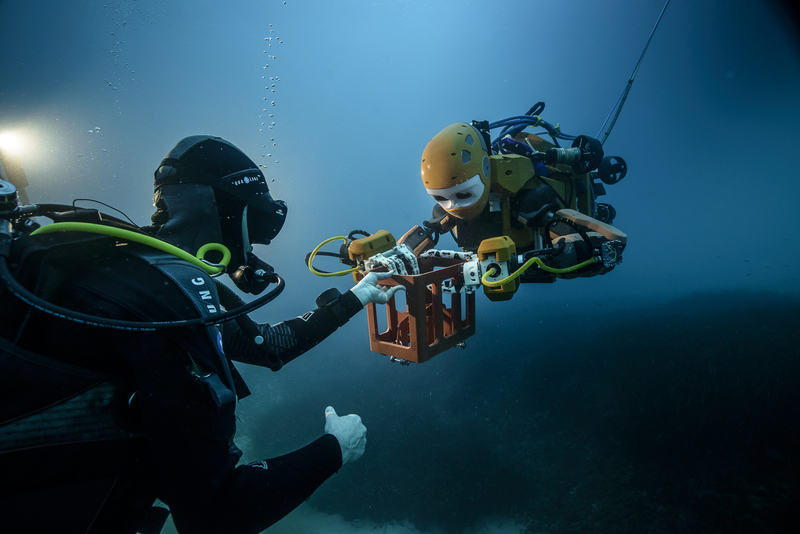 Smart algorithms enable the mermaid robot to avoid collisions and, with some help from the pilot, even use its hands to “swim” when stuck in a tight spot. If a crash is unavoidable, the humanoid robot can soften the impact by stretching out its arm. Since OceanOne is able to communicate with human divers through hand-gestures, it also makes a useful diving companion. 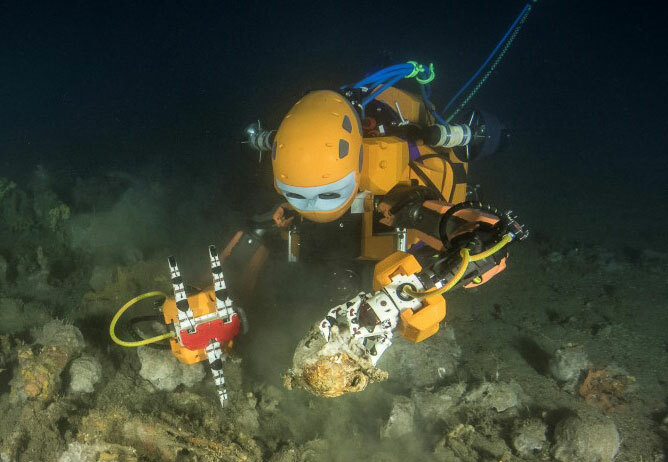 Sensors affixed to the robot’s arms and wrists enable the pilot to “touch” undersea objects and determine their weight and texture. This information is crucial in deciding the amount of force required to lift the object without damaging it. Additional sensors distributed around the robotic mermaid’s body keep track of the currents and ocean turbulence. Should the waters become too choppy, the robot can turn on the thrusters that are stored in the fin to stabilize itself. Though originally conceived to monitor coral reefs, OceanOne’s first mission was a tad more exciting. In April, the robotic mermaid was dispatched to investigate the wreckage of King Louis XIV’s flagship, La Lune, which sank off the coast of France in 1664. The robotic mermaid did not disappoint. Guided by Professor Khatib, OceanOne made its way 100-meters below the surface of the Mediterranean, carefully picked up a perfectly preserved grapefruit-sized vase, and placed it in the recovery basket. The mermaid robot then stood up and high-fived the dozen archaeologists and engineers that had accompanied it on this historic journey. 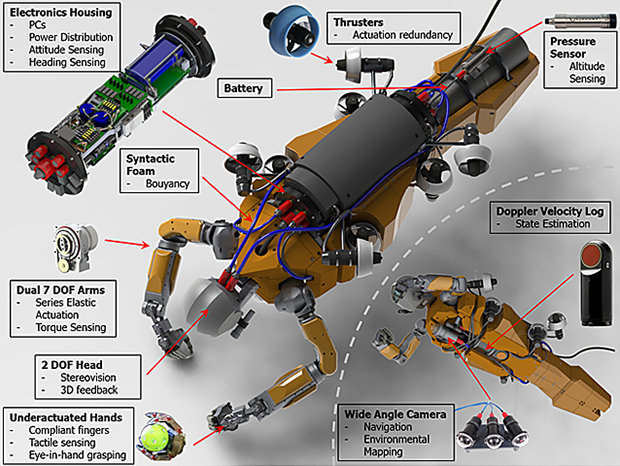 With the success of the prototype’s first undersea mission, it will be exciting to see what future, even more advanced versions of the humanoid diving robot, can accomplish!